On 31 July the gathering space at Hastings’ Sacred Heart Church hosted a festive meal to celebrate the 60th anniversary of Fr Pat McCann’s ordination as a priest of the Society of Mary. An old boy of St John’s College, Hastings, Fr Pat was ordained in 1953 by Archbishop McKeefry at Mount St Mary’s Seminary, Greenmeadows. For the next 25 years he taught science and maths at Catholic colleges, notably St Patrick’s College, Wellington. He then ministered in various parishes, including two stints at Whangarei. For six years in Rome during the 1980s he did secretarial work at the Marist Generalate. Fr Pat is presently chaplain at Auckland’s Monastery of the Adorers of the Sacred Heart of Jesus of Montmartre. 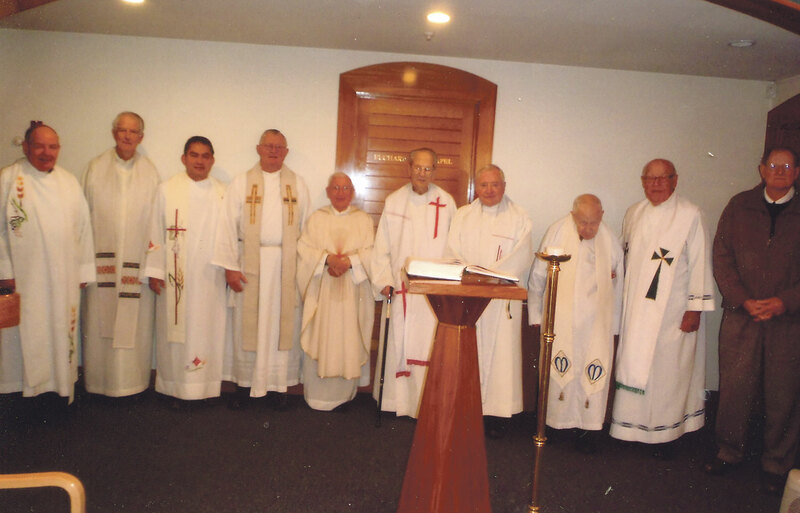 Fr Pat was joined at his jubilee Mass by several Marist confreres, who live locally, and two parish priests of the Heretaunga pastoral area. Fr Pat’s sister Brigid Newrick and her husband Des provided the meal. Among the well-wishers were three of Fr Pat’s classmates from St Joseph’s Primary School – John Baillie, Del Hamilton (nee Little) and Rex Ingram.